Happy birthday Brock Cole (The Goats) and Stephen T. Johnson (Alphabet City). It’s the birth date of Mary Louisa Molesworth (1839-1921), Tell Me a Story; T. H. White (1906-1964), The Sword in the Stone, The Once and Future King; and Eleanor Coerr (1922-2010), Sadako and the Thousand Paper Cranes. President John F. Kennedy (1917-1963) was born on this day. Read Jack’s Path of Courage by Doreen Rappaport, illustrated by Matt Tavares, and When JFK Was My Father by Amy Gordon. Happy statehood birthday to Rhode Island (1790) and Wisconsin (1848). Get out your party clothes! Today those in the know celebrate National Paper Clip Day. The modern version of this lowly but extremely useful object was patented on November 9, 1899 by William D. Middlebrook of Waterbury, Connecticut. But during World War II the paper clip became the symbol of national unity in Norway. Forbidden by the occupying Nazis from wearing buttons imprinted with their king’s initials, Norwegians wore paper clips on their lapels as a show of opposition. Citizens wearing this object could, and did, get arrested. Paper clips keep all kinds of valuable papers connected, and one of the heroes of the book of the day, Neal Shusterman’s The Schwa Was Here, collects them. He owns the paper clip that held together the Nuclear Arms Treaty signed by Reagan and Gorbachev. Just as paper clips usually go unnoticed, so does Calvin Schwa. He is the kid that everyone fails to see, the one that blends in, that no one notices and that no one pays attention to. Eighth-grade Anthony (Antsy) Bonono can’t remember when he first met the Schwa. As he says: “You couldn’t even think about him without losing track of your own thoughts—like even in your head he was somehow becoming invisible.” But the Schwa can go places and do things, without anyone noticing, like the faculty lounge at school, for instance. So Antsy becomes the Schwa’s agent, placing bets and collecting the money for the two of them as Calvin pulls off one stunt after another. All goes well until Antsy stretches too far. He wagers that the Schwa can enter the apartment of the rich local misanthrope, Old Man Crowly, a Howard Hughes type character, and get away with it. And when Calvin fails, suddenly both Antsy and the Schwa find themselves up against someone who can outthink and outwit them. Old Man Crowly insists they walk his fourteen Afghans every day as well as take care of his blind granddaughter. Then things really get tough for the boys. This true-to-life story has been executed with great humor and insight into kids. All the characters are wonderfully eccentric but seem as real as any that can be found in children’s books. Yet the book takes a very serious look at the way some children slip between the cracks, going unnoticed by adults or their peers. 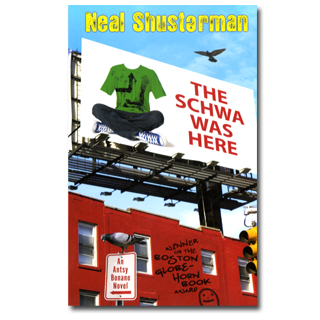 Winner of the Boston Globe–Horn Book Award for Fiction, The Schwa Was Here appeals to those eleven- to fourteen-year-olds who love a funny, realistic story with appealing characters that makes them think as well. Today I’m going to notice all the ways I use the paper clip—and really look at the people I see during the day. The Schwa Was Here reminds me to pay attention to everyone and everything. Originally posted May 29, 2011. Updated for . This sounds like a fascinating book, and one I’ve not read. oooh, gotta reserve this book!! What a fascinating story about the Norwegian soldiers…when I was in college, I won a prize for “smallest tool” at a “Tool Party” for bringing a paper clip. I just pulled “The Schwa was here” off the shelf and started reading. Wonderful. Wonderful post, Anita. I look forward to reading THE SCHWA WAS HERE. For those inspired by the Norwegian paper clips, Paper Clips is also the title of a documentary by Elliot Berlin about an amazing project undertaken by a class in Tennessee in their study of the holocaust. Such an evocative symbol. Ooh! This sounds wonderful! Library, here I come! This is a funny and delightful book. I laughed out loud in several places and chuckled in more. But, as Anita points out, this book is more than just funny. Like all good humor, it’s a commentary on difficult relationship issues – friendship, alienation, family – all handled deftly without any sentimentality or preaching. This book, and its companion book Antsy Does TIme are surefire hits with every boy 10-14 to whom I’ve given these books. Because of the humor and length, these are great for reluctant readers. Love these books. Anita – Who do you think would win in a contest between Mr. Crowly and Grandma Dowdel? I think it would be a pretty even match. One that they’d both enjoy ’cause they finally met someone at their fighting weight. Hee, now that that idea is in my head, I’m cracking up at the potential shenanigans these two would get up to. Eliza: Thanks for your comments on the book. I am going to enjoy thinking today about a Mr. Crowly/Grandma Dowdel match. It would be interesting. Although I know paperclips aren’t exactly the main point of your post I can’t help seeing the connection between that symbol as you’ve referred to it and the Holocaust Memorial project I blogged about a few years ago. A small school in Tennessee collects six million paperclips to get some grasp on how many Jews were killed during the Holocaust. Are you familiar with the book – Six Million Paperclips? And The Schwa Was Here looks like something I want to read both for the story and to see what I can learn from the writing. Thanks for this fun and insightful post, Anita. This is one of my favorite books of all time. I love the deft and deep handling of every character. The story, narrated by Antsy, is fantastic and believable at the same time in that perfect, kid-centric way.